On account of the ungodly heat we’ve been experiencing (seriously, it makes me feel like THIS), I’ve been craving frozen treats like the chubby 12-year-old I really am. 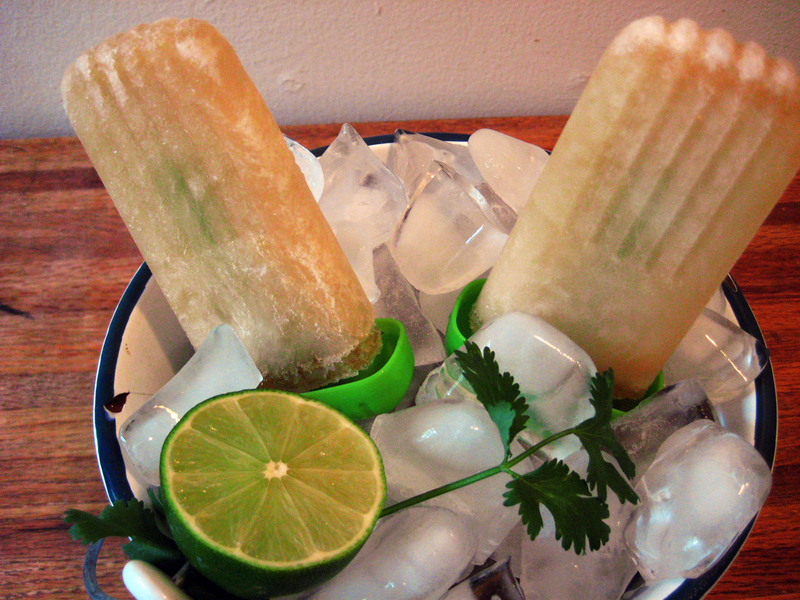 When we were little, my mom would make use popsicles out of various fruit juices and the molds she used were amazing. I think they were Tupperware and the sticks were yellow and had a little straw attached so as the popsicle melted you didn’t miss out on any of the drippy deliciousness. I, perhaps naively, assumed there would be a luscious bounty of popsicle molds in every grocery and convenience store below the Mason-Dixon but sadly there was not. I searched high and low – and by that I mean I want to Harris Teeter and Target – before deciding I would have to purchase my molds off the ole interwebs. I found these Tovolo molds on Amazon and was sold as soon as I read the reviews. Everyone loved them but complained that they are just too big. Seeing the considerable size as a pro and not a con, I ordered them post-haste. After being disappointed by my first popsicle attempt – green tea, honey, cream, and blueberries – I decided to go with something more fun. I had cilantro and lime in the fridge for another recipe and decided to use it to make a flavored simple syrup and combine it with Vernor’s Ginger Ale and Gosling’s Dark Rum for a Dark ‘n Stormy-esque treat for the chubby 12-year-old inside who also may or may not be a lush. Step 2: Heat the juice of a really juicy lime, a big handful of chopped cilantro, 1/2 cup sugar and 1/2 cup water until the sugar is dissolved and the syrup tastes lime-y and cilantro-y to your liking. Step 3: Combine 1 1/3 C Vernor’s Ginger Ale – NO OTHER KIND WILL DO, except maybe Gosling’s Ginger Beer, absolutely not some Seagrams or Canada Dry nonsense – 1/3 C cilantro-lime simple syrup and 1 T Goslings Dark Rum in a large measuring cup. Step 4: Pour mixture into molds and freeze overnight. 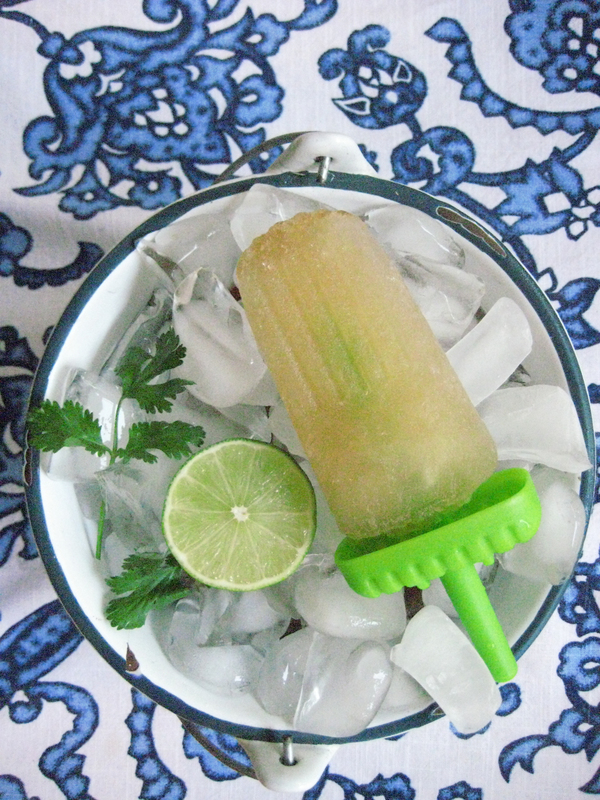 This makes 4 pops because I also just happened to have some grapefruit italian soda and silver tequila lying around and I thought they might combine well with the cilantro-lime simple syrup for a Paloma-esque popsicle. Turns out I was right. 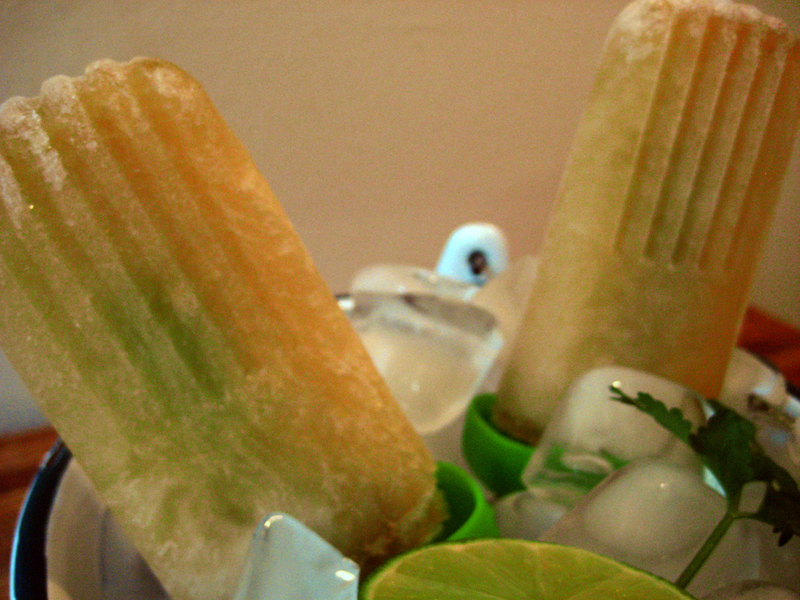 The recipe for the Palomita Pops is exaclty the same as the recipe for the Dark ‘N Stormy-ish pops just substitute the Vernors for Grapefruit soda and the rum for silver tequila (I like THIS kind) and boom – delicious adult popsicles for a blazingly hot summer. This entry was posted in better food, dessert, summer and tagged ginger ale, popsicles, poptails, rum, summertime, tequila by Grace. Bookmark the permalink.